Sensei Tanaka is the founder and chief Instructor of TANAKA's MARTIAL ARTS ACADEMY and has been teaching Karate in Alaska since 1969. He is a Nihon Karate-Do Kenwa Kai Int'l 9th Dan (9th Degree Black Belt), Hodo Ryu Kobudo Federation 9th Dan (9th Degree Black Belt), a World Karate Federation (WKF) 7th Dan (7th Degree Black Belt) and is a former member of both the Pan American Karate Federation and the the World Karate Federation Referee Committee. Sensei Tanaka is the chairman of the Technical Committee of the USA Karate which is the governing organization for Karate in the USA. Sensei Tanaka holds the world's highest licenses and qualifications possible in Karate and is the most senior referee in the USA and Pan American areas. (The Pan American areas consists of the Caribbean, North America, Central America, and South America countries.) He is a World Karate Federation Kata Judge A and Kumite Referee A, one of a very few people qualified to judge contestants at the World Games, Pan American Games, Pan American Championship, and World Champion levels of competition. Currently, there are only 10 people in the U.S.A. and only 85 people among 188 member countries who have both the Kata and Kumite Licenses. Sensei Tanaka began his study of the martial arts in 1960. He attended Nagoya-Gakuin University (NGU), in Nagoya, Japan and joined the University Karate Team in his freshman year. During his sophomore year in NGU, Sensei Tanaka earned the position of captain. While on the University Karate Team, he took 2nd place in the Central Japan Karate Championship in 1966 and went on to take 1st place in the Championship in 1968. In 1969, after graduating from NGU with a B.A. degree, Sensei Tanaka came to Anchorage, Alaska as an exchange instructor with the Alaska Methodist University (AMU), now the Alaska Pacific University, teaching Karate and Table Tennis at AMU in the Physical Education Department. While at AMU, he began taking courses and in 1974, received a B.S. degree. In 1970, Sensei Tanaka also began teaching Karate for the University of Alaska – Anchorage (UAA) and in 1974 enrolled in UAA, earning a BBA in 1976. To date, he has earned three university degrees. Sensei Tanaka found the first seven years in this country was the most difficult time in his life; he taught Karate at two universities, his own academy, community karate programs and also had to devote enormous time and effort toward his academic studies due to language difficulties. He credits his training in Karate as the key to his success. Training in Karate instilled in him the commitment, self-discipline, and mental concentration necessary to persevere and follow the plan that he laid out for himself to a successful conclusion. In essence, this is what Karate is: to envision what lies before you, to commit your mind to seeing it through, and to giving your best in the end. Sensei Tanaka is an internationally well-known instructor and has been on the cover of 4 national magazines: Inside Karate, Karate Illustrated, Inside Kung Fu, and Masters and Styles, and has been featured several times in Black Belt Magazine . He has been featured in two films, has made over 70television appearances, and has been the guest star and performed demonstrations on over 70 talk shows. Sensei Tanaka has endeavored to educate the public as to the true meaning of studying the martial arts and its values. For his devoted efforts promoting Martial Arts in Alaska, Sensei Tanaka received a special award from the Legislature in 1981 and the Governor’s Award in 1994. In 2004, he received the Japan foreign Ministers Award. Sensei Tanaka’s students have achieved all levels of success in Karate. He has produced many National and International Champions, USA Karate Team Athletes and a world highest Karate referee. In 2003, Vassar Bradford became the 1st American to become a World Karate Champion in Kata. Other student accomplishments include a silver medal in the Junior World Cup, a gold medal in the Junior Pan American Karate Championship, and countless gold medals in the U.S.A. National Karate Championships and Junior Olympics since 1994. Sensei Tanaka consistently sets exceptionally high standards for his students. His dedication and leadership has helped his students to become goal-oriented individuals, not only in Karate, but in everyday life as well. Students have learned to set high goals for themselves, commit themselves to achieving them, and put forth the determined effort and discipline needed to reach them. Sensei Tanaka is a firm believer in improving one’s self, both mentally and physically, to be the best you can be. Sensei Tanaka strongly emphasizes the importance of Manners, Respect, and Self-Discipline to his students. He is dedicated most towards improving the character of his students through Karate – helping them to develop strong values of manners and respect, good sportsmanship, humility, self-confidence, and self-discipline. These are the most important characteristics of studying Karate. 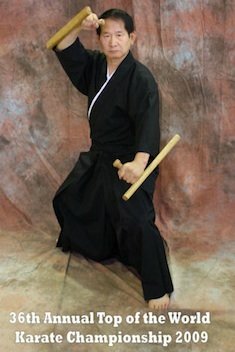 Sensei Tanaka is devoted toward educating people as to the real purpose of studying Karate – the development of one’s self to their fullest potential. Today, Sensei Tanaka’s goals are to help his students become the best they can be mentally, physically, and academically. He is dedicated not only to teaching his students the true meaning of studying Karate, but also to helping his students learn how to succeed in life. Ultimately, Sensei Tanaka is striving to make our society a better place to live through his students.